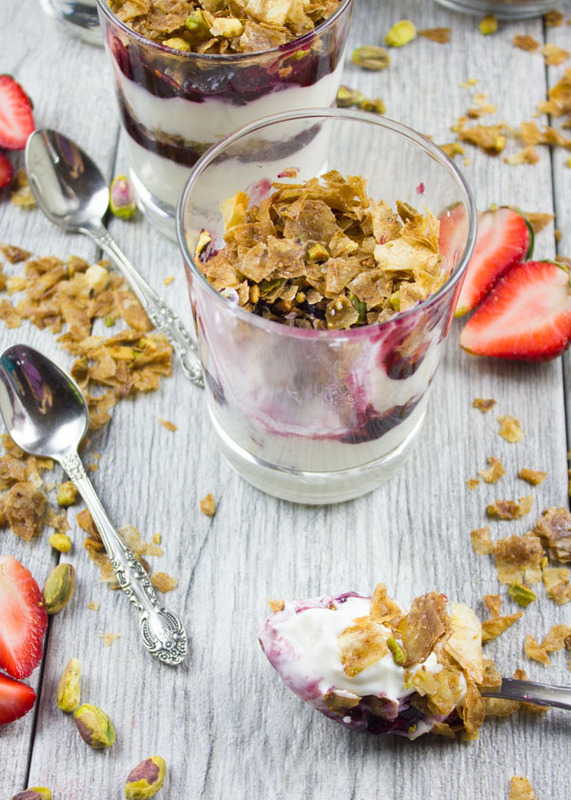 Move over granola, this Baklava Yogurt Parfait with Homemade Baklava Crumbles has taken over your crown! This Baklava Yogurt Parfait with Baklava Crumbles is taking your yogurt parfait-game to a whole other level. More so it’s like taking your breakfast to a really upscale level. 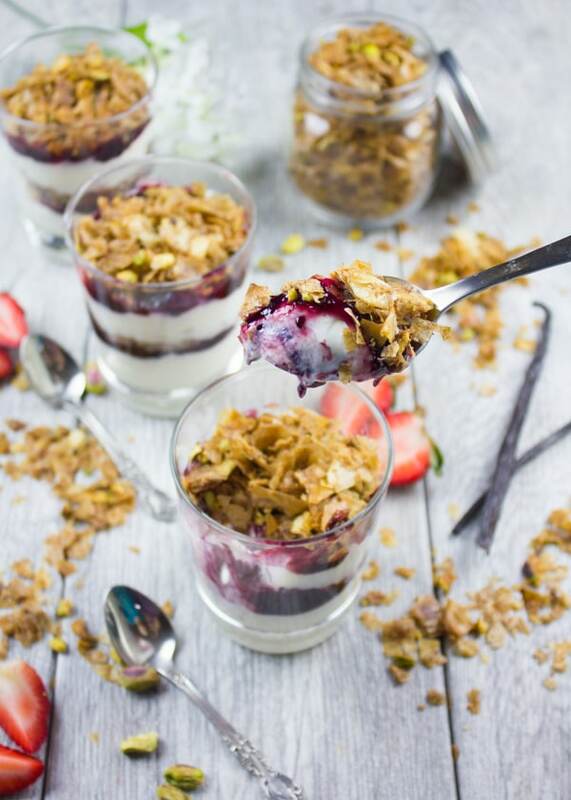 And even better, these Baklava Yoghurt Parfaits make a perfectly divine dessert that’s actually good for you and loaded with yogurt goodness! 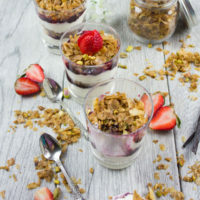 No matter how you looked at yogurt parfait before, this recipe for Baklava Yogurt Parfait is a heavenly version of it. Today’s recipe for Baklava Yogurt Parfait with Homemade Baklava Crumbles is like a dream come true. The ultimate combo of our favorite things—a yogurt parfait and a baklava dessert. All in one cup. Better yet, all in one spoon with every bite. Plus a touch of honey and mixed berries to round off the sweetness. It feels like a really divine dessert to me, but I’ll happily make it for a special breakfast or brunch, too! In fact, it’s one of those easy breakfast recipes you can make in advance. 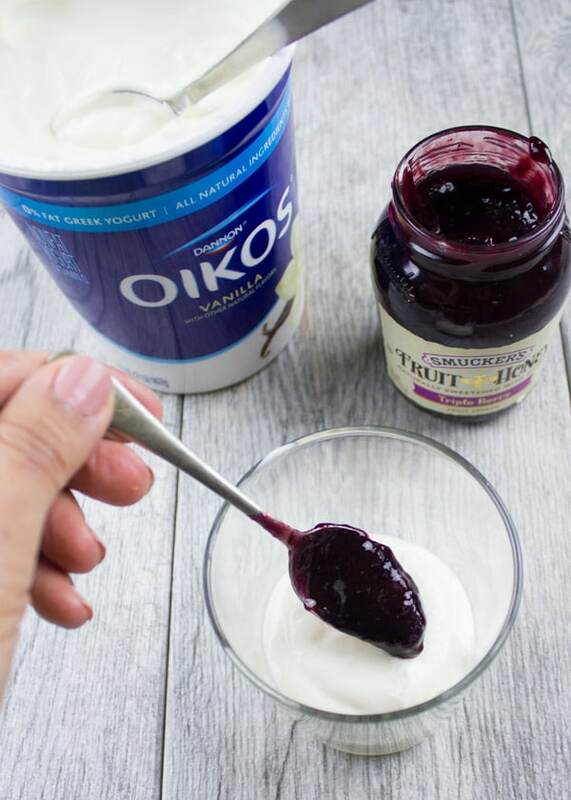 I prefer leaving it up to you when it comes to how much yogurt versus jam versus baklava you use, because it’s really a personal taste thing. For me, and since it’s a yogurt parfait, the yogurt is the star of this dessert. The jam is a thin layer of fruity honey berry sweetness to freshen up the dessert. When it comes to the baklava crumbles, again it’s a thin layer about double that of the jam (again, that’s just my taste) because I love to taste the crunch, the nuts and that contrast in textures is heavenly! 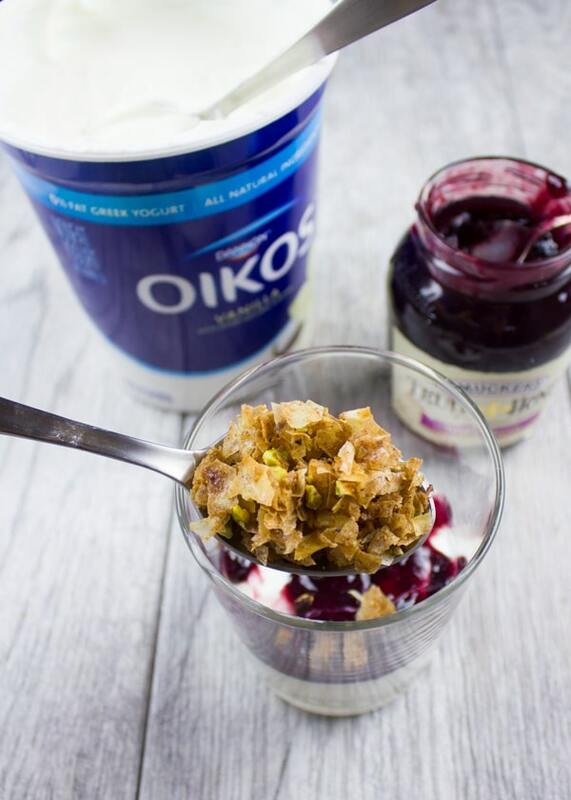 The combo of creamy yogurt, chewy fruity jam and crunchy baklava with nuts is perfection. There’s something quite intimidating about making baklava, so these homemade baklava crumbles are a great way to get you started. 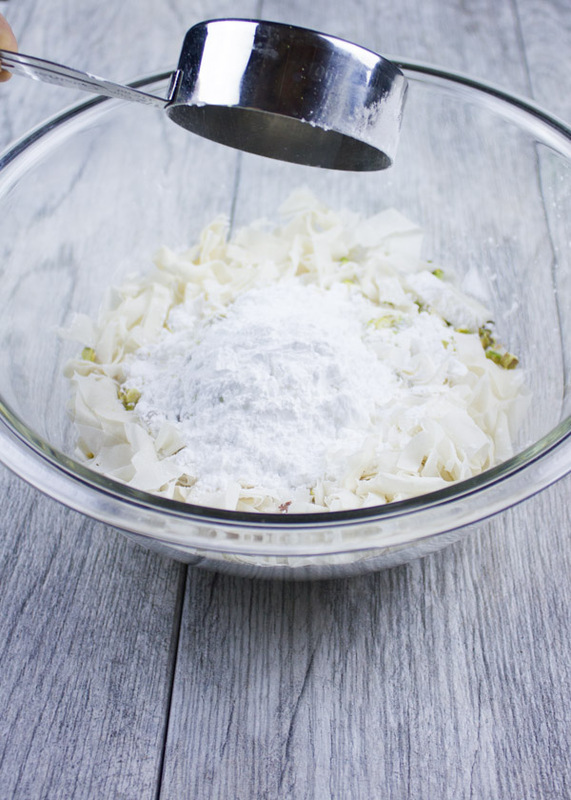 You’ll simply need some phyllo dough, cut it up with scissors or simply tear them up with your hands into a large bowl. Then you’ll add pistachios (any nut or combo of nuts work great!) and spices. I’ve used cinnamon and a pinch of nutmeg. For a touch of sweetness, I’ve added some confectioner sugar. 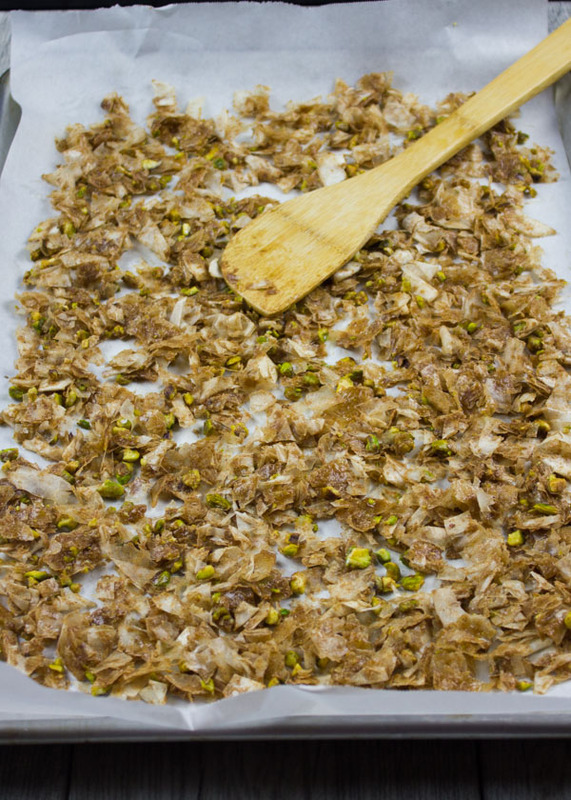 Finally, you can’t have baklava without the butter so you’ll need a bit of melted butter to toss these shreds together. Spread those phyllo shreds on a baking sheet and bake them for just 8-10 minutes until lightly golden. And that’s it! Perfect baklava crumbles for you to snack on or use for a yogurt parfait, instead of cereal or as a topping for desserts! And the good news is these baklava crumbles will stay in an airtight container for over a month! In a glass cup ( bowl or any serving cup of your choice) start layering 2 tablespoons of vanilla yogurt at the bottom. Add a tablespoon of jam, followed by a tablespoon and a half of baklava crumble. Repeat the same process twice (more or less to your taste) and serve the Baklava Yogurt Parfait right away or wrap it up and chill it for unto 4 days. 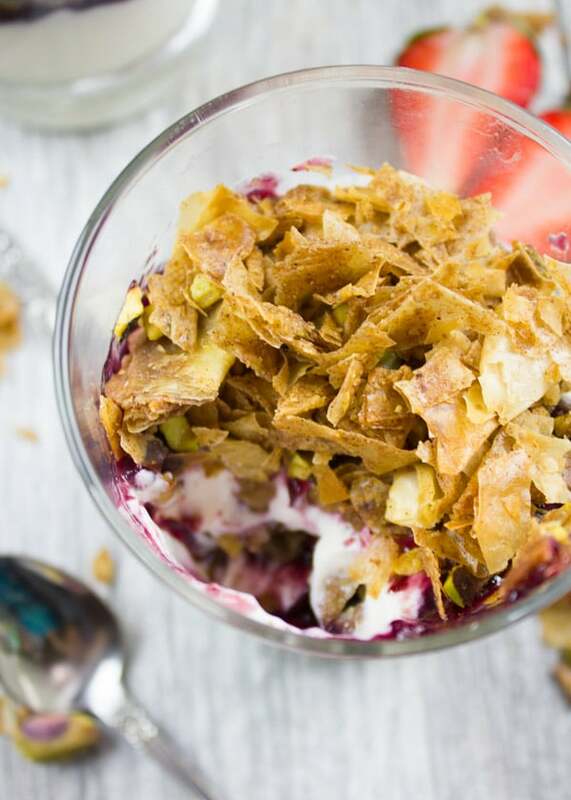 The beauty of this Baklava Yogurt Parfait is that you can make it way ahead of time. The baklava crumbles are made at least a month ahead of time. The yogurt parfait can be made at least 3 days ahead of time when covered up with plastic in the fridge! You can also prepare the baklava crumbles ahead of time, and serve all the ingredients separately. 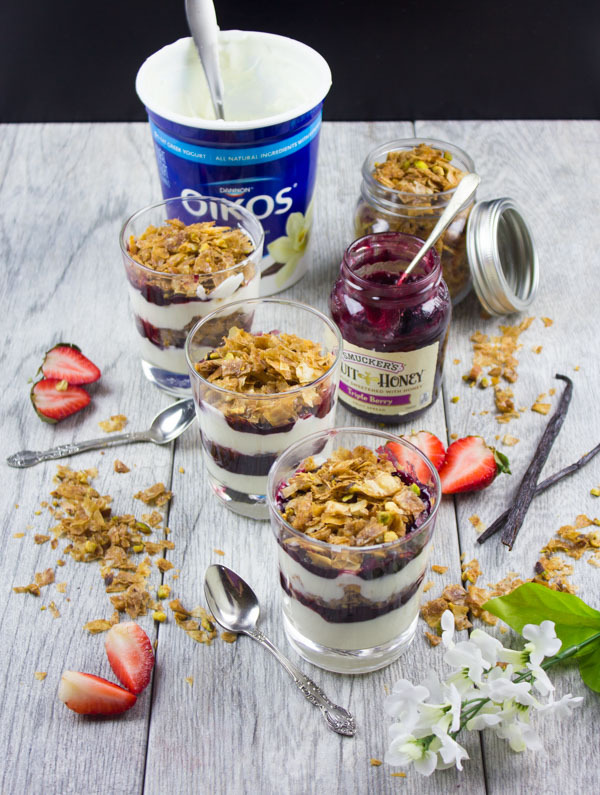 That way, you can have your guests assemble their own baklava yogurt parfaits for a fun DIY – dessert! Take the phyllo dough sheets and layer them over each other. 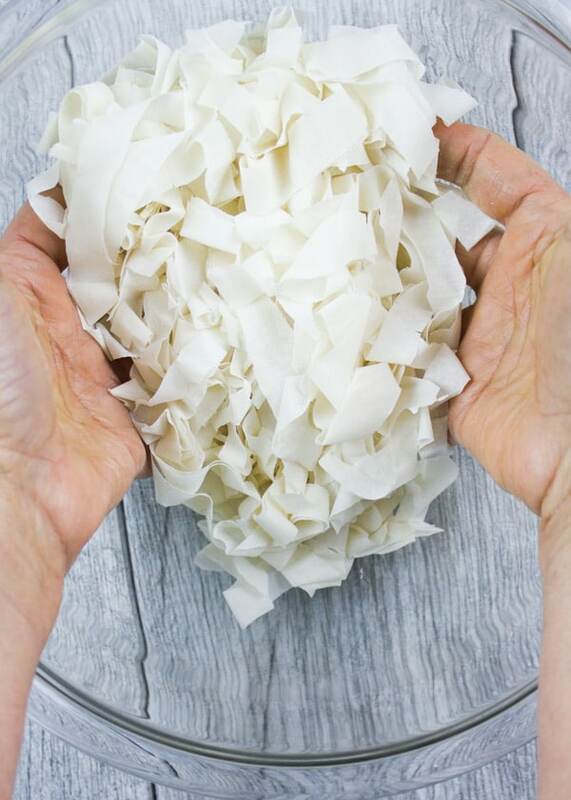 Take an edge of the phyllo dough rectangle and roll out the dough into a tube shape. 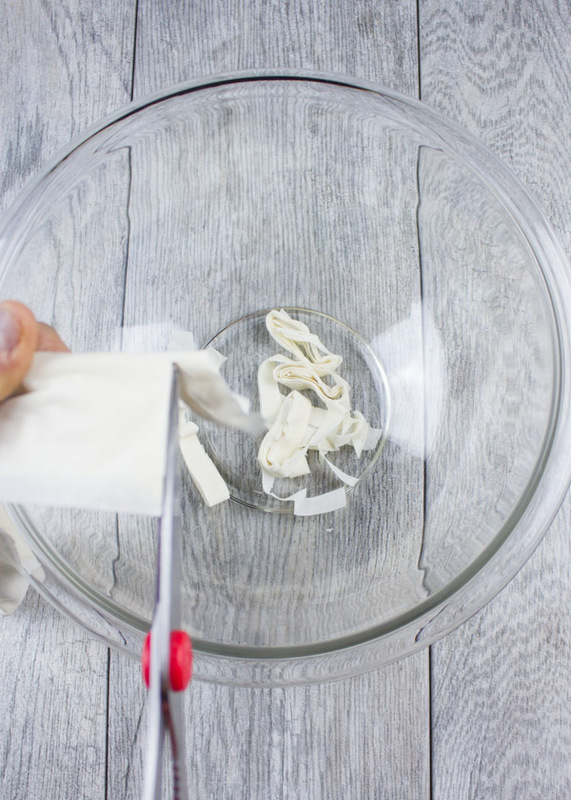 Use your scissors to cut out a fourth of an inch strip of the rolled phyllo dough over a large bowl. 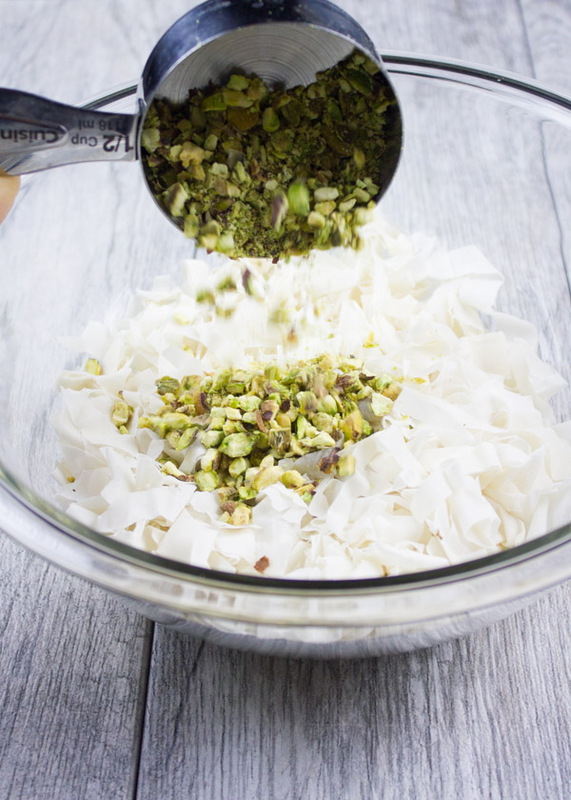 Add the pistachios, sugar, nutmeg and cinnamon over the phyllo strips and use your hands to toss the mixture together—don’t worry about tearing up pieces of the strips because it will crumble anyway. Add the butter a tablespoon at a time to the phyllo mixture and toss everything very well. Now spread the phyllo mixture on a parchment lined baking sheet and bake for 10-12 minutes. You’ll need to rotate the baking sheet and toss the phyllo mixture gently with a wooden spoon to make sure the heat is evenly distributed. 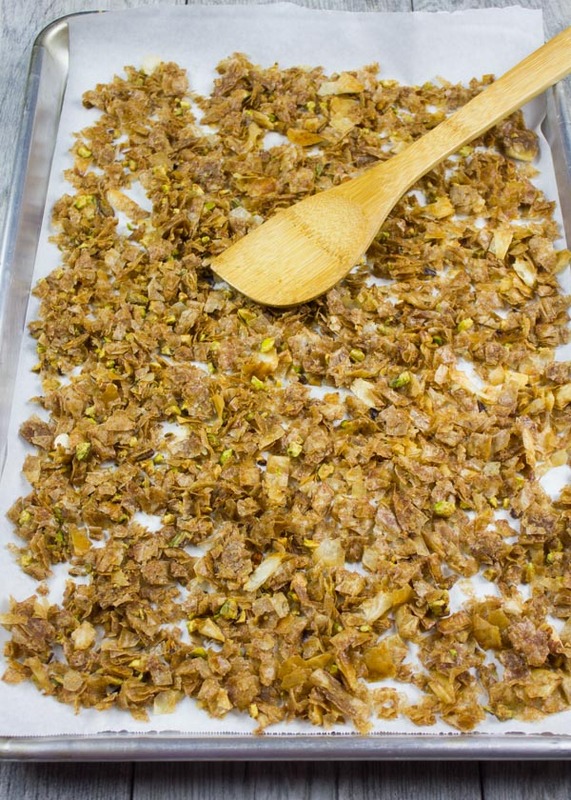 Remove the baklava crumble from the oven when it turns golden and slightly crisp. The crumble will crisp up more as it cools. 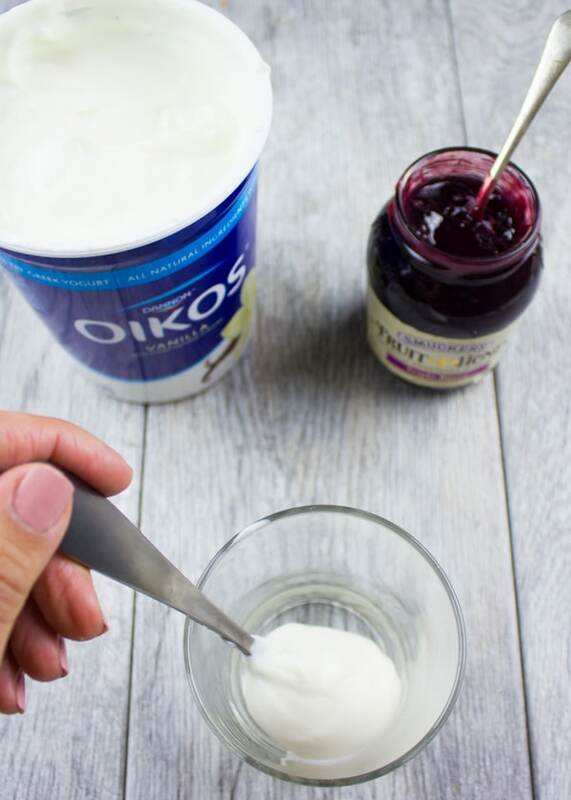 In a glass cup ( bowl or any serving cup of your choice) start layering 2 tablespoons of yogurt at the bottom, followed by a tablespoon of jam, followed by a tablespoon and a half of baklava crumble. You can also prepare the baklava crumbles ahead of time, and serve all the ingredients separately. 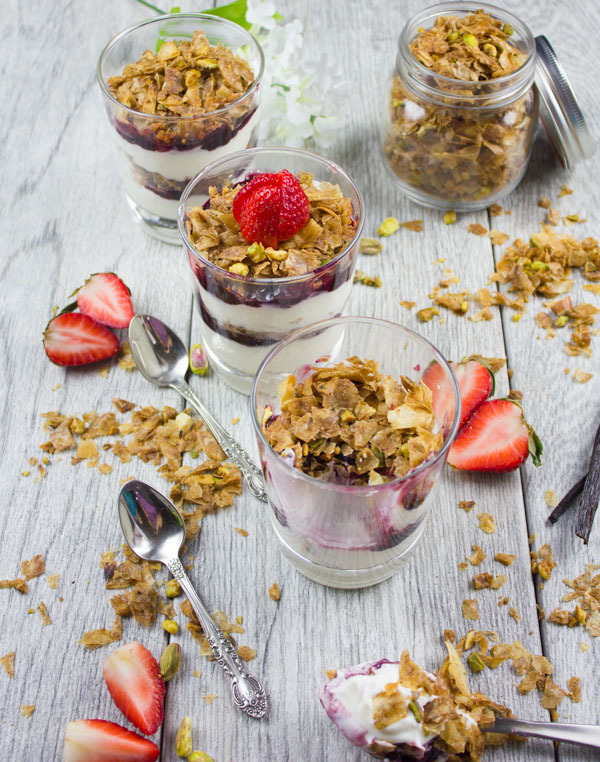 That way, you can have your guests assemble their own baklava yogurt parfaits for a fun DIY - dessert! I love baklava and I would eat it in any form its served to me. This is so cute for a coffee meeting with some friends next week- Cant wait to try it! I was seriously talking about baklava today. This would satisfy that craving! For sure it would Paula! Yogurt is totally my favorite! 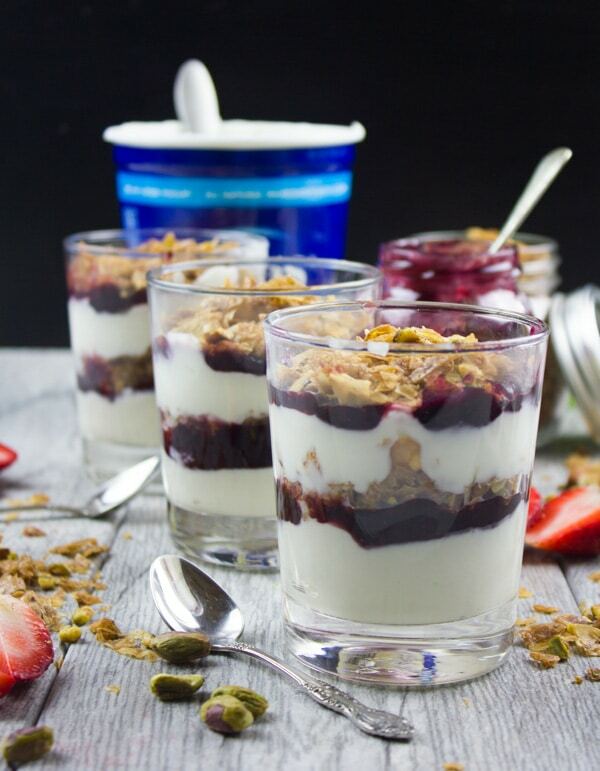 These parfaits look delicious and almost too pretty to eat! This takes parfait to another level Allyson! Perfect breakfast recipe! Love the colors and the different textures! I have always wanted to make something with baklava! 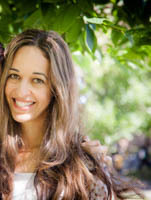 This is the perfect chance Krista!